But seven years later, as journalist Leander Kahney reveals in this definitive book, Tim Cook: The Genius Who Took Apple to the Next Level, things at Apple couldn’t be better. Its stock has nearly tripled, making it the world’s first trillion dollar company. Under Cook’s principled leadership, Apple is pushing hard into renewable energy, labor and environmentally-friendly supply chains, user privacy, and highly-recyclable products. From the massive growth of the iPhone to lesser-known victories like the Apple Watch, Cook is leading Apple to a new era of success. Drawing on unprecedented access with Apple insiders, Kahney tells the inspiring story of how one man attempted to replace someone irreplacable, and–through strong, humane leadership, supply chain savvy, and a commitment to his values–succeeded more than anyone had thought possible. 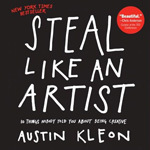 In his now-classic books Steal Like an Artist and Show Your Work!, both New York Times bestsellers, Austin Kleon gave readers the keys to unlock their creativity and become known for it. 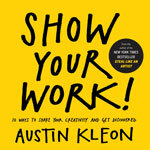 Now he offers his most inspiring work yet, Keep Going: 10 Ways to Stay Creative in Good Times and Bad, offering clear, powerful guidance for how to stay creative, focused, and true to yourself—for life. Some of Austin’s key advice: The creative life is not a linear journey to a finish line, it’s a loop—so find a daily routine, because today is the only day that matters. Disconnect from the world to connect with yourself—sometimes you just have to switch into airplane mode. Get outdoors and take a walk (as director Ingmar Bergman told his daughter, “The demons hate fresh air”). Pay attention, and especially pay attention to what you pay attention to. Worry less about getting things done, and more about the worth of what you’re doing. Instead of focusing on making your mark, work to leave things better than you found them. 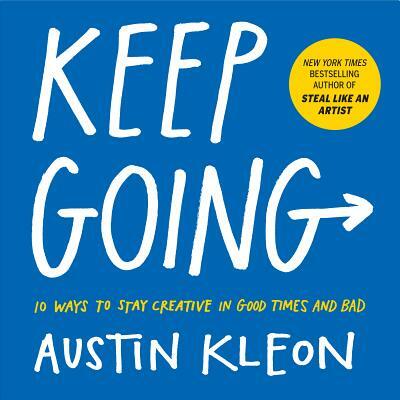 Keep Going offers timeless, practical, and ethical principles for anyone trying to sustain a meaningful and productive life. Common advice is to find and follow your passion. A life of passion is a good life, or so we are told. But it’s not that simple. Rarely is passion something that you just stumble upon, and the same drive that fuels breakthroughs–whether they’re athletic, scientific, entrepreneurial, or artistic–can be every bit as destructive as it is productive. Yes, passion can be a wonderful gift, but only if you know how to channel it. If you’re not careful, passion can become an awful curse, leading to endless seeking, suffering, and burnout. Brad Stulberg and Steve Magness, the authors of Peak Performance, once again team up, this time to demystify passion in The Passion Paradox: A Guide to Going All In, Finding Success, and Discovering the Benefits of an Unbalanced Life, showing readers how they can find and cultivate their passion, sustainably harness its power, and avoid its dangers. They show readers how to develop the right kind of passion, the kind that lets you achieve great things without ruining your life. This thought-provoking book combines captivating stories of extraordinarily passionate individuals with the latest science on the biological and psychological factors that give rise to and help sustain one’s passion. Jez Burrows opened the New Oxford American Dictionary and sat, mystified. Instead of the definition of “study” he was looking for, he found himself drawn to the strangely conspicuous, curiously melodramatic sentence that followed it: “He perched on the edge of the bed, a study in confusion and misery.” It read like a tiny piece of fiction on the lam and hiding out in the dictionary—and it wasn’t alone. Was it possible to reunite these fugitive fictions? To combine and remix example sentences to form new works? With this spark and a handful of stories shared online, Dictionary Stories: Short Fictions and Other Findings was born. This genre-bending and wildly inventive collection glows with humor, emotion, and intellect. Effortlessly transcending sentence level, Burrows lights between the profound and the absurd, transporting readers into moments, worlds, and experiences of remarkable variety. 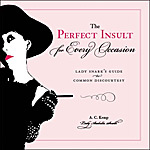 Featuring original illustrations by the author, Dictionary Stories is a giddy celebration of the beauty and flexibility of language. In a very real sense we define our lives through our stories. Understand these stories, along with the motivations behind them, and we can positively change how our future unfolds. With this premise, Elle Luna, artist and author of The Crossroads of Should and Must, and psychotherapist Susie Herrick present Your Story Is Your Power. 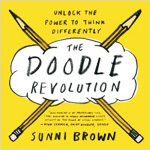 Beautifully designed and illustrated with Luna’s watercolor artwork throughout, this inspiring and practical hands-on guide shows women how to uncover and understand their own stories in order to live more confident, unapologetic lives. Your Story Is Your Power is a guided introspection, bringing us from the influences that created the way we think and engage with the world into our own personal stories. By using a series of psychologically astute exercises that focus on the reader’s experience of being female, the reader will identify and understand how she is shaped by family, cultural stereotypes, personality type, personal myths, and more. And as in any successful therapy, the heart of this knowledge gained leads to a clearer sense of self and purpose, both in one’s personal life and in the larger community of women. A few common principles drive performance, regardless of the field or the task at hand. Whether someone is trying to qualify for the Olympics, break ground in mathematical theory or craft an artistic masterpiece, many of the practices that lead to great success are the same. In Peak Performance: Elevate Your Game, Avoid Burnout, and Thrive with the New Science of Success, authors Brad Stulberg — a former McKinsey consultant and journalist who covers health and the science of human performance — and Steve Magness — a performance scientist and coach of Olympic athletes — team up to demystify these practices and demonstrate how everyone can achieve their best. The first book of its kind, Peak Performance combines the inspiring stories of top performers across a range of capabilities – from athletic, to intellectual, to artistic – with the latest scientific insights into the cognitive and neurochemical factors that drive performance in all domains. 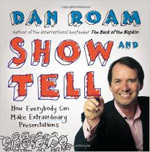 In doing so, the book uncovers new linkages that hold promise as performance enhancers but have been overlooked in our traditionally-siloed ways of thinking. 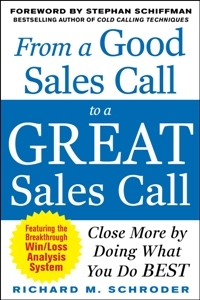 The result is a life-changing book in which readers will learn how to enhance their performance by a myriad of ways including: optimally alternating between periods of intense work and rest; developing and harnessing the power of a self-transcending purpose; and priming the body and mind for enhanced productivity. If you want to take your game to the next level, whatever “your game” may be, Peak Performance will teach you how. Of all the world’s great cities, perhaps none is so defined by its Art Deco architecture as New York. Lively and informative, New York Art Deco: A Guide to Gotham’s Jazz Age Architecture leads readers step-by-step past the monuments of the 1920s and 30s that recast New York as the world’s modern metropolis. Anthony W. Robins, New York’s best-known Art Deco tour guide, includes an introductory essay describing the Art Deco phenomenon, followed by eleven walking tour itineraries in Manhattan, each accompanied by a map designed by legendary New York cartographer John Tauranac and a survey of Deco sites across the four other boroughs. Also included is a photo gallery of sixteen color plates by nationally acclaimed Art Deco photographer Randy Juster. Robins is a historian and writer who specializes in the architecture of New York City. A former division director at the New York City Landmarks Preservation Commission, has led walking tours of New York for thousands of locals and visitors to the city. In New York Art Deco, Robins has distilled thirty years’ worth of experience into a guidebook for all to enjoy at their own pace. An employee leaves and you post the open position. Resumes trickle in. You interview a few candidates. No one fits the bill. The next thing you know, three months have passed and that desk is still empty… Nothing drives business success like a staff of talented, productive employees. So why accept a hiring process that fails you time and time again? Well, there’s one person who doesn’t: Scott Wintrip. And in High-Velocity Hiring, he provides the tools and systems for creating a hiring process designed for today’s fast-paced, talent-deficient landscape. Using the proven methods Wintrip has applied at some of today’s more forward-thinking companies, you’ll hire top employees faster — and smarter. High-Velocity Hiring replaces the old, worn-out way of hiring with the simple but revolutionary approach of actively cultivating top talent before positions open. The old way is slow and inefficient. Wintrip’s way is dynamic and proven-effective. You’ll enrich and maintain a flow of high-quality candidates, harness this flow by identifying the most talented people, and channel it into a pool of ready-to-hire prospective employees. More than ever, hiring the best people requires foresight, planning, alertness, and decisive action. With High-Velocity Hiring, you have everything you need to seize the high-ground in the war for talent and maintain it for long-term growth and profitability. Deep within the American Dream lies the belief that hard work and steady saving will ensure a comfortable retirement and a better life for one’s children. But even for many families who seem to be doing everything right in an era of unprecedented prosperity, this ideal is still out of reach. In The Financial Diaries: How American Families Cope in a World of Uncertainty, NYU economist Jonathan Morduch and Center for Financial Services Innovation SVP Rachel Schneider draw on the groundbreaking U.S. Financial Diaries project, which followed the lives of 235 low- and middle-income families as they navigated through a full year. Combining hard facts with in-depth personal stories, The Financial Diaries presents an unparalleled inside look at the economic stresses of today’s families and offers powerful, fresh ideas for solving them. In 2000, Keith Devlin — Stanford mathematician, author of 30+ popular math books, and NPR’s “Math Guy” — set out to research the life and legacy of the medieval mathematician Leonardo of Pisa, popularly known as Fibonacci, whose book Liber abbaci has quite literally affected the lives of everyone alive today. Although he is most famous for the Fibonacci numbers — which, it so happens, he didn’t invent — Fibonacci’s greatest contribution was as an expositor of mathematical ideas at a level ordinary people could understand. In 1202, Liber abbaci — the “Book of Calculation” — introduced modern arithmetic to the Western world. Yet Fibonacci was long forgotten after his death, and it was not until the 1960s that his true achievements were finally recognized. Finding Fibonacci: The Quest to Rediscover the Forgotten Mathematical Genius Who Changed the World is Devlin’s compelling firsthand account of his ten-year quest to tell Fibonacci’s story. Devlin, a math expositor himself, kept a diary of the undertaking, which he draws on here to describe the project’s highs and lows, its false starts and disappointments, the tragedies and unexpected turns, some hilarious episodes, and the occasional lucky breaks. You will also meet the unique individuals Devlin encountered along the way, people who, each for their own reasons, became fascinated by Fibonacci, from the Yale professor who traced modern finance back to Fibonacci, to the Italian historian who made the crucial archival discovery that brought together all the threads of Fibonacci’s astonishing story. Is it possible both to be a conscientious citizen of the world and grow one’s own wealth? Jonathan DeYoe, the author of Mindful Money: Simple Practices for Reaching Your Financial Goals and Increasing Your Happiness Dividend, says yes, and he explains exactly how. Money drives many of our decisions. We all worry about earning it, spending it, and saving it ― regardless of our income level or spiritual perspective. Yet few of us understand money’s true nature. Jonathan K. DeYoe, a California-based financial adviser with twenty years’ experience as well as a longtime Buddhist, helps you create a unique financial plan that is guided by your deepest beliefs, and shows you how to save, invest, pay off debt, and fund your retirement and dreams by building a lifetime income stream. With a foreword by Pulitzer Prize-winner Alice Walker, Mindful Money does all this while emphasizing that money is a tool you can use to support your lifestyle, reach your goals, and earn the “happiness dividend” everyone deserves. In An Extraordinary Time, acclaimed economic historian Marc Levinson, author of The Box, and The Great A&P, describes how the end of the postwar boom reverberated throughout the global economy, bringing energy shortages, financial crises, soaring unemployment, and a gnawing sense of insecurity. Almost everywhere, the pendulum swung to the right, bringing politicians like Margaret Thatcher and Ronald Reagan to power. But their promise that deregulation, privatization, lower tax rates, and smaller government would restore economic security and robust growth proved unfounded. Although the guiding hand of the state could no longer deliver the steady economic performance the public had come to expect, free-market policies were equally unable to do so. The golden age would not come back again. A sweeping reappraisal of the last sixty years of world history, An Extraordinary Time forces us to come to terms with how little control we actually have over the economy. One of the earliest of all Buddhist texts, the Atthakavagga, or “Book of Eights,” is a remarkable document, not only because it comes from the earliest strain of the literature–before the Buddha, as the title suggests, came to be thought of as a “Buddhist”–but also because its approach to awakening is so simple and free of adherence to any kind of ideology. Instead the Atthakavagga points to a direct and simple approach for attaining peace without requiring the adherence to doctrine. The value of the teachings it contains is not in the profundity of their philosophy or in their authority as scripture; rather, the value is found in the results they bring to those who live by them. Instead of doctrines to be believed, the Book of Eights describes means or practices for realizing peace. 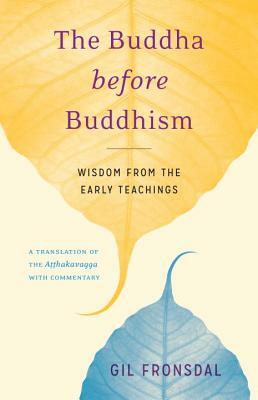 Now in The Buddha before Buddhism: Wisdom from the Early Teachings, Noted Buddhist teacher and scholar Gil Fronsdal‘s rigorous translation with commentary reveals the text to be of interest not only to Buddhists, but also to the ever-growing demographic of spiritual-but-not-religious, those who seek a spiritual life outside the structures of religion. Thousands of years ago, early humans had an innate need to communicate, but no written language. So they found an easy and natural way to share their thoughts and stories: pictures. Today, after so many years when speaking and writing grew dominant, we’re back in another highly visual age. About 90 percent of everything shared online is now visual – selfies, GIFs, smartphone videos, and more. To survive and thrive in this new visual era, it’s important to harness the power of imagery. 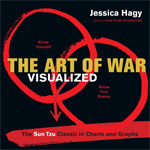 You don’t need to be Leonardo da Vinci to be an outstanding visual thinker and communicator. The most effective drawings are the simplest, and you can get good at those in three minutes. 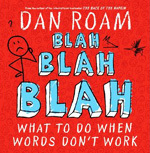 In this clear, powerful little book, Draw to Win, international bestselling visual thinking guru Dan Roam teaches you how to use seven basic shapes to explain just about anything to just about anyone. Get ready to work smarter, communicate more clearly, and get better at whatever you do, just by picking up a pen. – Producer and performer Mike Rugnetta on why “Do what you love” is both the best and worst piece of advice you’ll ever receive. – Author, television writer, and humorist Emma Koenig on staying focused and productive no matter what life throws at you. – Web comic Zach Weinersmith on the equation for success and using your creativity to do what the rest of us won’t. – Trendspotter Jess Kimball Leslie on identifying your skills and turning it into a successful career. “Disruption” is a business buzzword that has gotten out of control. Today everything and everyone seem to be characterized as disruptive. Now in The Disruption Dilemma, leading young economist Joshua Gans cuts through the chatter to focus on the current realities of disruption, decades beyond its first introduction by Clayton Christensen (who in fact blurbed this book). Departing from the conventional wisdom, Gans identifies two kinds of disruption: demand-side, when successful firms focus on their main customers and underestimate market entrants with innovations that target niche demands; and supply-side, when firms focused on developing existing competencies become incapable of developing new ones. 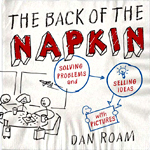 Gans describes the full range of actions business leaders can take to deal with each type of disruption, from “self-disrupting” independent internal units to tightly integrated product development. But therein lies the disruption dilemma: A firm cannot practice both independence and integration at once. Gans shows business leaders how to choose the right strategy so their firms can deal with disruption while continuing to innovate. In this short e-book (about 14,000 words), Stanford mathematician and NPR’s “Math Guy” Keith Devlin presents the fascinating similarities between 13th Century mathematician Leonardo of Pisa, more commonly known as Fibonacci, and Steve Jobs, the 20th Century founder of Apple computers. A companion to Devlin’s book The Man of Numbers: Fibonacci’s Arithmetic Revolution, Leonardo & Steve: The Young Genius Who Beat Apple to Market by 800 Years shows the uncanny parallels between Leonardo’s arithmetic revolution that took place in Tuscany centuries ago and the one that began in California’s Silicon Valley in more recent times. It is a story about the personal computing revolution that occurred in the 1980s, but with the novel twist that it was actually history repeating itself.